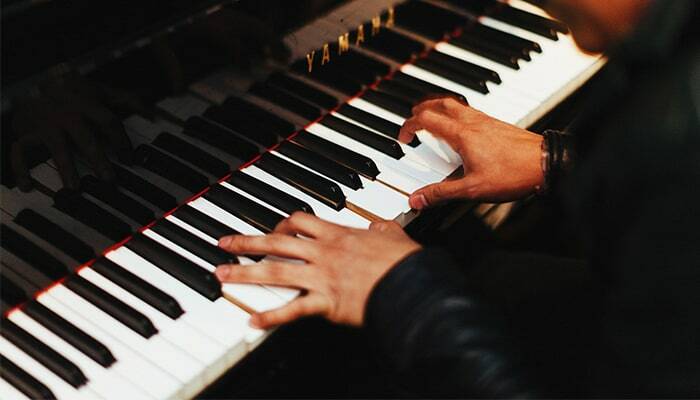 Every pianist will encounter chords sooner or later, regardless of if they realize it or not. The fact is, that pretty much all Western music is built upon a series of chords, no matter which genre you play. Mozart’s music never says anything about what chords should be played, but the music is still very much built on chords. Since chords are so important, it’s good to learn about them early, even if you’re a beginner at piano. 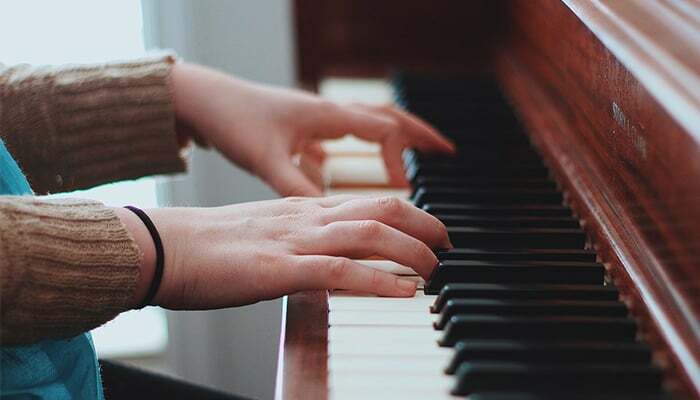 Learning to recognize and play different chords is something that will not only allow you to play pop songs but will also help you to read music faster. 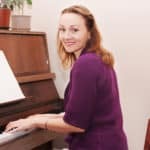 I’m going to tell you everything you need to know about chords as a beginner/intermediate piano player, but the article is applicable to people who play other instruments and simply want to learn more about music theory. In order to learn about something, it’s usually helpful to know why we need to learn it, so that’s the question I’m going to answer first. As I mentioned, chords are the basis for almost all Western music and they lay the foundation for our melodies. One very important reason to learn chords is that it will help you to read and understand music better. If you, for example, know exactly what notes are in a C major chord, and then you get to a bar in your piece of music that contains the notes C, E and G, you’ll be able to play them much quicker, because you recognize them as a chord, and not as three separate notes. This is the same thing that happens when we read a normal text. When you are reading this article, your brain is not reading every single letter individually but recognizing patterns and words that you know well. The more words you have read during your life, the easier it gets, and it’s the same when we use our knowledge of chords when we read music. Another reason why it’s extremely useful to learn chords is that it’s such an easy way to play music effortlessly, without having to practice or read music. If you know chords well, and you know how to use them, you’ll be able to find the chords for a particular song you like, and just play it straight off the page, without practicing. This is not only fun but can be a very good skill if you want to jam with your friends. Knowing your chords will take away many limits, and it will help you to improvise freely, as well as help you compose and arrange music. We’re now going to take a look at the two most common types of chords, that the other chords are built on, let’s build a foundation to our house of chords! You’re probably already familiar with the concept of major and minor. Major sounds happy, and minor sounds sad. But why do they sound different from each other? It all comes down to the third. Just to clarify, we call the root note 1, and then we can count up the scale. So if we have a C chord, C is going to be 1. The 1 in a C chord will always be C, no matter if it’s major or minor. The second note we’re going to locate for the chord is note number 5, which you will find on G. G will always be the fifth in a C major or minor chord. So what I’m saying is, if you place your right hand over the keys, thumb on C, and then let all the fingers have one key each, you have a good positioning. You will be using your outer fingers, 1 and 5 on the first and fifth step. Now for the middle note, the third. In major chords, the third is major, and in minor chords, the third is minor. In the example of C chords, you will use Eb (E-flat) for C minor, and E for major chords. 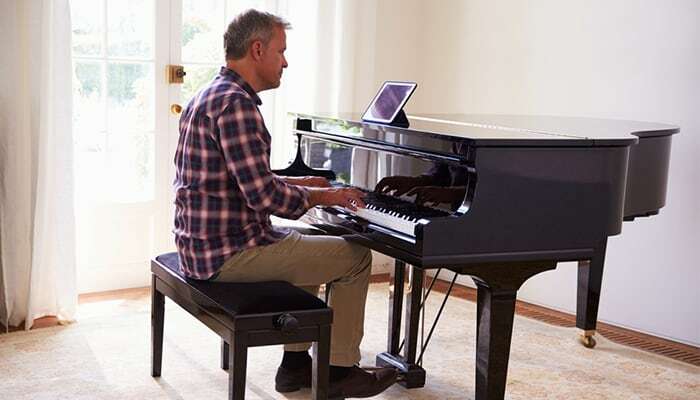 If you have access to a piano right now, go and try to play the two and listen to the different sound qualities. Major chords are written just using the letter, so if it says ‘C’, it really means ‘C major’, and minor chords are written with an m after the note letter, like ‘Cm’. One way to learn all the major and minor chords is to simply memorize them, using a chord table. 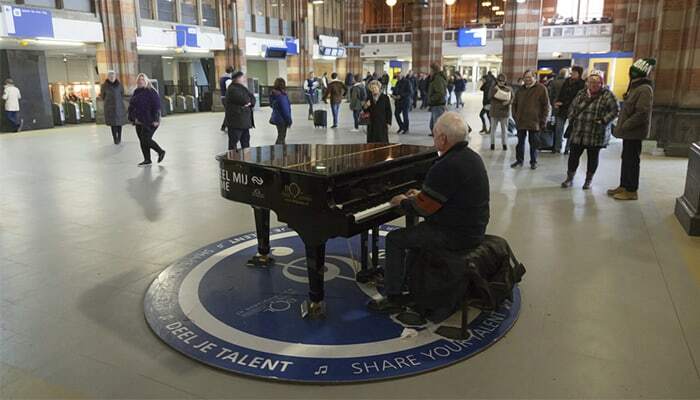 You can easily find one online by searching for ‘piano chord table’. But the problem with this way of learning is that it might take you years before you really understand how the chords really work and realize that they’re not just random notes that sound good together. For this reason, I really like the counting system. It’s easy, you just have to remember two number combinations. For minor chords, you’re going to count: 123, 1234. For major chords, it’s the opposite: 1234, 123. By counting one of these two patterns, you’ll be able to figure out all major and minor chords. This is how it works. Let’s take the example of C again. You start at C, you know that already, so no need to count to figure that one out. The next note you need to find out is the third. If you are looking to figure out what C minor looks like, your going to start on the very next key after C, C# and count 123. Don’t skip any keys. You should end up on Eb. Then, when you have managed to find your way to your minor third, you’re going to start on the very next key after it and count 1234. Hopefully, you have ended up on G. This means that C minor includes the notes C, Eb, and G.
For major chords, you’re going to do the same thing, but count 1234 from C to E and then 123 to get to G.
Try this pattern starting from different keys to figure out minor and major chords! Ok, so now you know that you use step 1, 3 and 5 to build a chord, either minor or major. There is nothing wrong with these chords, but sometimes you just want something more fun. One way that we can make music interesting is to create tension in one way or another. This means to make the music sound less resting in one place, more on its way to somewhere else. Seventh chords are an excellent way to do this and they are the most common variation to the normal minor and major chords. You’re already familiar with step 1, 3, and 5, and now, we’re going to add the note on the seventh step from the root note as well. 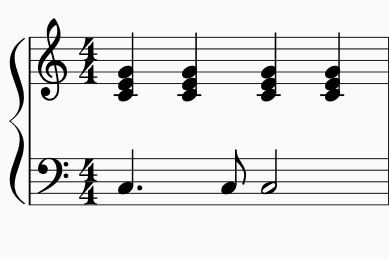 The seventh note is determined by the root note, not by if the chord is minor or major. There are both minor seventh chords and major seventh chords. There are two different kinds of sevenths that we’re going to take a look at. Remember how I said that the third in the chord is either major or minor? Sevenths works like that too, but sound completely different. This is one of those moments when the English language is going to confuse us a little bit. Let’s keep minor and major, as in ‘we have a minor or major third, therefore, the music sounds sad or happy altogether’ apart from whether the seventh is minor or major, which is just to tell us if it’s small or big, you could say. Other languages will use other words for the modes of minor and major, and reserve minor or major for telling if a note is low or high. Like if the root note is C, there are two sevenths, Bb and B. Bb is a minor seventh and B is a major, as in small and big. Because of this potential confusion, the chords using the minor seventh are commonly called dominant sevenths. We’ll get back to why they’re called that. Let’s try out a normal, dominant C7 chord! Play it using C, E, G, and Bb. Now replace the Bb with a B instead and you’ll get a much jazzier chord. If a chord is just written as a letter and a 7, like C7, then you know that it’s the dominant seventh they’re after, and you’ll just say C-seven. If it’s a major seventh, it will be written as Cmaj or Cmaj7. It can also be written as CΔ. As you might have guessed, it can sometimes be more difficult to play seventh chords, if you try to play all four notes instead of three, like in normal minor or major chords. The thing is that now that we have four notes, there is one that we simply can exclude if we want to. We can’t take away the root note (generally speaking, there are exceptions) because that’s the most important note and we can’t skip the third, because that’s the note that determines if the chord is minor or major. If we take away the seventh, it won’t be a seventh chord. So we’re left with the fifth. What does the fifth do? Well, not all that much, to be completely honest, and nobody will probably notice if we exclude it from our seventh chords! One type of chord that you’re going to encounter once in a while are suspended chords. With these chords, you take out the third and replace it with either a second or a fourth. The sus4-version is the more common type. What the sus4-chord does is that it creates a suspension. You really, really feel like that fourth needs to go down to the third, where everything is stable and normal, and it most often does. It’s quite unusual to use a sus4-chord without releasing the fourth down to the third to play the basic triad of the chord. What would you play if you saw a chord called G9? You probably guess that the 9 refers to the ninth step of the scale, that is one note above the octave, namely A. But if it says G9, you are going to have the seventh, F, in there as well. It’s like we’re just building up notes but can’t be bothered to write G79. (It does look really weird, don’t you think?). Now, it would be different if it said Gadd9. Then you’re just adding the ninth note and nothing else. The same goes for other numbers, such as 11. Diminished chords are built using minor thirds that you stack on top of each other. There are really just three different diminished chords since there are twelve notes and four notes in each chord. We would still call them differently depending on the context and which note we want as the root note. A C-dim is, for example, C, Eb, Gb, A. 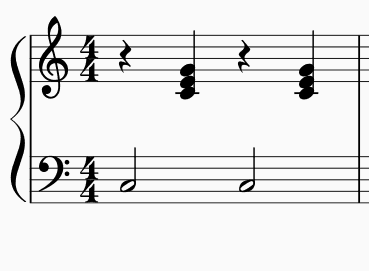 A diminished chord is most often written like this: C°, but it could also say Cdim or Cdim7. You’d think that there’s just one way to play every chord, but every chord has a couple of inversions. The way you would play a regular C, with C as the root note, and then E and G on top is called the root position. The thing is that we don’t always want to play chords using their root positions. One reason is that it might be fun to have the third as the root note, just to alter the sound a bit, or perhaps we want to use the fifth as the root in order to create a cool bassline together with the other chords. Another reason is that when you play chords, you should always be looking for the closest way to play the next chord, its closest inversion. The first inversion, if we stick to C, would be taking away the C and adding it on top instead. So that would make E the root. We’d have E, G, and C in that order. The second inversion would be G, C, and E.
If you want to try this out, try playing a C in its root position and then a G in its root position. Even though it’s not super difficult, there is still a pretty big motion, and the two chords don’t sound very close. Now try to play C in its second inversion, G, C and E. Then switch to G in its root position. As you can tell, you’re able to keep G, and just change the two upper notes. This is a good way of playing chords. Always think about if there are any notes in the chords that are mutual that you can keep in place. This will not only make the music sound coherent but will make it easier to play as well, when you’ve mastered it. Sometimes you’ll find that somebody has already done the thinking for you and written out which note you should have in the bass. It might say G/B, for example. 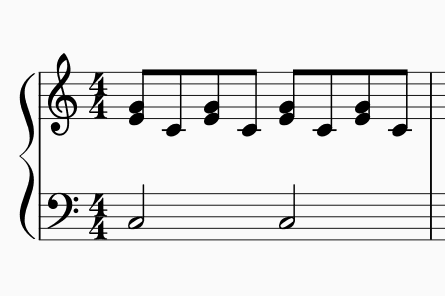 The letter B indicates which note should be the lowest. How you tackle that depends on how you’re playing your chords. If you play the melody in your right hand and the chords with the left, you’ll have no choice but to play the G chord in its first inversion, with B as its root. But if you play the chords in the right hand and use your left for the bass notes, you could play B in the left hand (and other stuff on top if you fancy), and play G in its root position in the right hand. Now we sort of know how to find out what notes are in different chords, but you probably also want to find out how to actually play them and use them to create music. The short answer to the question is that you can use them in so many different ways and everything is possible. This might not be very helpful to a beginner but is pretty much the truth with a few exceptions. But if you just want to get started we’re going to look at a few easy ways to play the chords you just learned. If you want to hear an example of this pattern, listen to ‘Where everybody knows your name’ from Cheers. The right hand is going to play quarter notes, and the left hand is going to play long-short-long. To hear what the left hand sounds like, listen to the bass in ‘You’ve got a friend’ by Carole King. The right hand is easiest to hear in Michael Bublé’s ‘Haven’t met you yet’. To hear what our third example sounds like, listen to ‘We’ve only just begun’ by Carpenters. As you can see, you’re breaking the chord up in the right hand, alternating between the two top notes being played together, and the root note. There are endless of variations, feel free to come up with your own! Another way to play using chords is to incorporate them when you play the melody. You can add chord notes under the melody notes, to create a fuller harmony. You could listen to pretty much any instrumental piano cover on Spotify or YouTube to hear examples of this. At first, it might seem like songs are made up on just about any chords. You may not see a connection between a G7 and a C, two chords that only share one common note, but when you learn about harmonic functions you suddenly realize how all the chords are connected. We are going to learn a few essential words that describe the relationship between the chords in a key. This is going to be useful because it will enable you to more easily find out chords for songs you already know, and to compose new songs. If you learn these functions, you’ll also be able to improvise more easily, because you know what chords go well together. It will also make it easier for you to transpose music. To make everything as easy as possible, we’re going to look at the harmonic functions in the key of C major. All these functions can then be transposed to any key. The very first, and most important chord, is what’s called the tonic. In the key of C major, the tonic is the chord C.
This is our home, the base that the rest of the music circles around, and eventually always leads back to. And even if it wouldn’t, you would feel it in your bones. 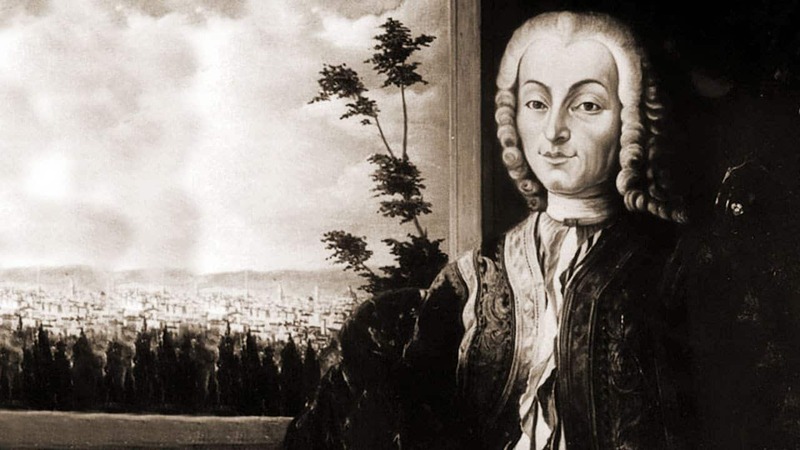 There is a history I heard about how Mozart when he was little, had a disagreement with his dad. 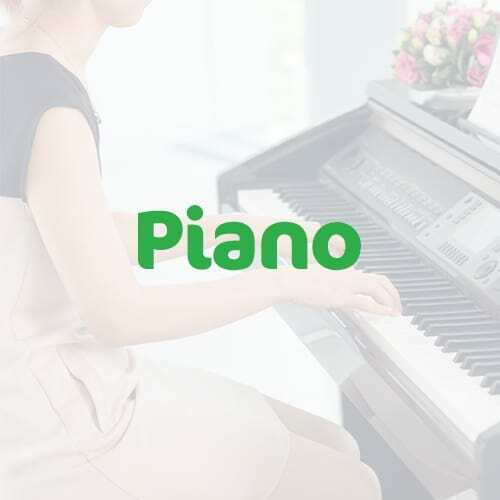 To annoy him, young Mozart got up in the middle of the night, went to the piano and played some of the other functions that you’re going to learn about. Just when he was going to play the tonic after the dominant chord he stopped and went back to bed. This made it impossible for his father to get back to sleep until he himself got up, played the tonic, and finished the song. I’m not sure if this story is true or not, but it does illustrate the importance of the tonic. So to sum things up the tonic is found on the first step of the scale, and is the base and foundation of the rest of the music. The next function we’re going to learn about is the subdominant. You’ll find it on the fourth step of the scale. Can you find out what the subdominant is in C major? The subdominant often comes after the tonic but can be placed elsewhere in a chord progression. 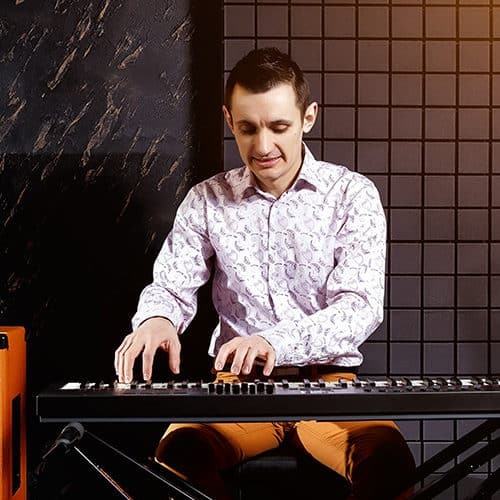 To find out the reason why the subdominant works so well after the tonic, we need to learn about the next chord that is built on the fifth step, which is called the dominant. As we just learned, the chord that is built on the fifth step of the scale is called the dominant. In C major, the dominant chord is G, but we’ll happily add a 7 to it as well very often! Remember the dominant 7? See the connection? The dominant is actually very dominant in its nature. It has a will of its own and is striving to get to the tonic. Let’s get back to the subdominant just for a brief moment. Do you remember how the subdominant often comes after the tonic? The reason why this feels so natural is that the tonic is actually the dominant to the subdominant! Look at your keyboard and you’ll see that the note C is five steps over F.
Anyway, let’s get back to the dominant chord. When we add a seventh to the dominant chord, this feeling of the music striving to the tonic grows even stronger, and you just have to go to the tonic. Of course, there are times when a musician will choose not to, just to get a reaction from the listener. The dominant chord is special in this way, but there is another thing that is quite different about it. So far, we’ve only looked at chords in C major and only encountered major chords. But if we would have been in a minor key, the tonic and the subdominant would have been minor. The dominant chord in a minor key is different because it will most often be major. All the chords that we just talked about have parallel chords that are a little bit like their cousins. Just like all keys have parallel keys, the chords have them too, and they are found in the same place. The chord C, for example, has a parallel chord in Am. Am is the tonic parallel to C.
The tonic parallel is the most commonly used parallel. Likewise, if you have a song in the key of A minor, the tonic parallel is C.
In major keys, you’ll go down a minor third to find the parallel chord, and in minor keys, you’ll go up a minor third. The parallel tonic in a major key will be minor, and the opposite applies for minor keys. Let’s see if you can figure out what the subdominant parallel in C major is? That’s right, it’s Dm. And the dominant parallel is Em. It might seem really overwhelming to read this entire article if you’ve never played any chords before. If that’s the case, just learn the bits about how to find major and minor chords to start with. You can combine this article by looking at a chord chart. Start by learning songs with very few chords and build up your knowledge gradually. Then, when you eventually encounter more difficult stuff that you want an explanation for, come back, and it will make more sense. I truly hope that this introduction to chords is going to help you to play the piano better and enjoy it more!